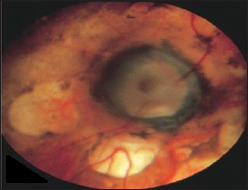 A 35-year-old female, with a history of retinal surgery, presents with the following clinical picture [Figure 1]. Identify this condition, which layer is usually affected? And the probable cause? 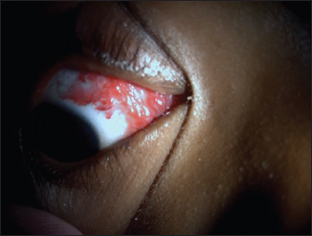 A 65-year-old male presents with a history of painless, persistent redness in one eye that is gradually progressing [Figure 2]. What could be the most probable diagnosis? Name one noninvasive test of diagnosis. A 1-year-old child was brought to the ophthalmologist, with complaints of poor fixation in both eyes since birth, associated with infantile spasms and magnetic resonance imaging brain showing agenesis of corpus callosum. What is the most probable diagnosis based on the fundus finding in [Figure 3]? 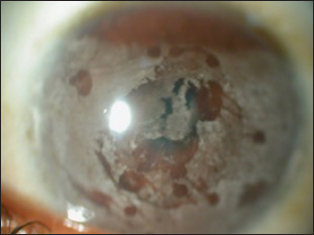 Name two characteristic fundus features of this syndrome. 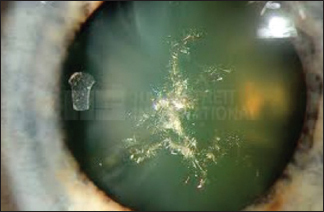 Identify this type of cataract [Figure 4]. Name one condition associated with it. 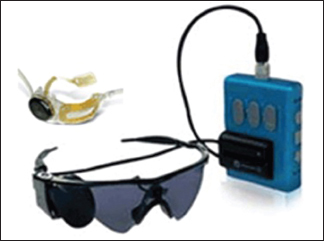 Name this cool ocular gadget [Figure 5].